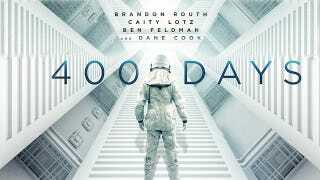 The movie 400 Days was released earlier this year in theaters and on demand. The premise is straightforward - four aspiring astronauts are isolated for the titular 400 days to simulate a space journey; odd things start happening. But the ending seems to be a bit divisive. Let’s discuss it. Obviously discussing the ending of a movie is by definition spoilery. But I’ll stick this warning here anyway. The crew is getting regular shots, supposedly vaccinations, though we never see the doctor give herself one of the shots (though she is popping pills). Two crewmembers are definitely hallucinating. One is seeing his son and the other is having a strong dose of paranoia with his. Late in the mission an intruder in the bunker causes the crew to venture outside. It looks like some major catastrophe has struck the area and things are dark the whole time they are outside. They find some people who tell them the moon was struck by an asteroid and the Earth is covered by a cloud of moon dust. Dane Cook’s paranoid character thinks they are really still in an elaborate simulation. He meets a woman in a bar and disappears. The guy who keeps seeing his son also disappears. The two remaining astronauts get back to the bunker but are followed by some of the survivors. The astronauts kill the intruders. Just then a message from the man who sent them into the bunker tells them their 400 days are over. The main hatch opens above them with bright light shining in. The movie ends there with no further explanation. For me, the simple explanation that the Earth suffered a catastrophe while the astronauts were underground works. The vast majority of what we see supports that. The two missing astronauts probably ended up as sausage and pot roast for the surviving townspeople. But there are plenty of loose threads and questions. What was really in the mystery injections? What happened to the missing teddy bear (which appears in an unlikely place later)? Why did a townswoman look like the magazine centerfold (and was that why the astronaut who recognized her disappeared)? Was the crew having a mass hallucination or perhaps they’re really dead because of the oxygen problem? I presume the ending was left open to allow it to be open to interpretation and I freely admit I could be wrong about the ending.